This is the time of year when commercial and sports fishermen generally head into the coastal waters off Southeast Alaska in search of the largest and most prized catch of all — the chinook, also known as king salmon. Most years, they expect to haul in at least 30,000 fish over just a few days in a flurry of fishing. Large chinook can weigh more than 40 pounds, and fishermen get $5 to $8 a pound, far more than they get for other types of salmon. But in early August, the Alaska Department of Fish and Game made the difficult and unusual decision to cancel commercial and sport chinook fishing for the rest of the summer. 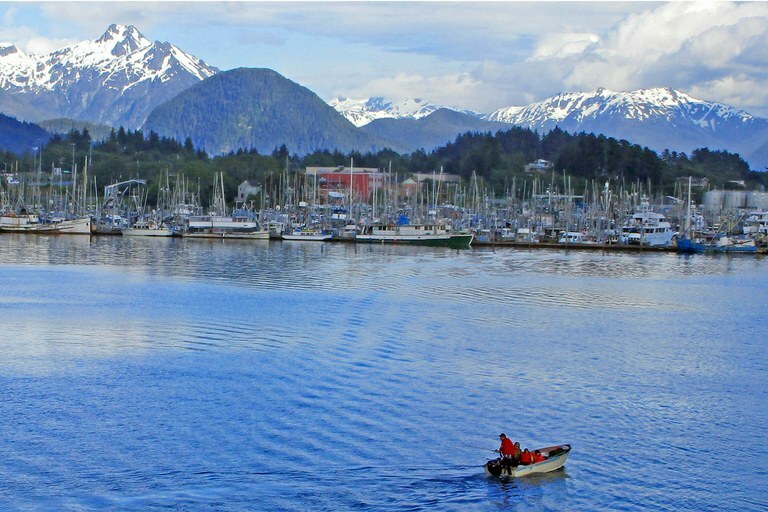 A lone skiff floats beyond the fishing boats docked at the marina in Sitka, in Southeast Alaska, in 2016. This year, the chinook salmon season has been cancelled there. 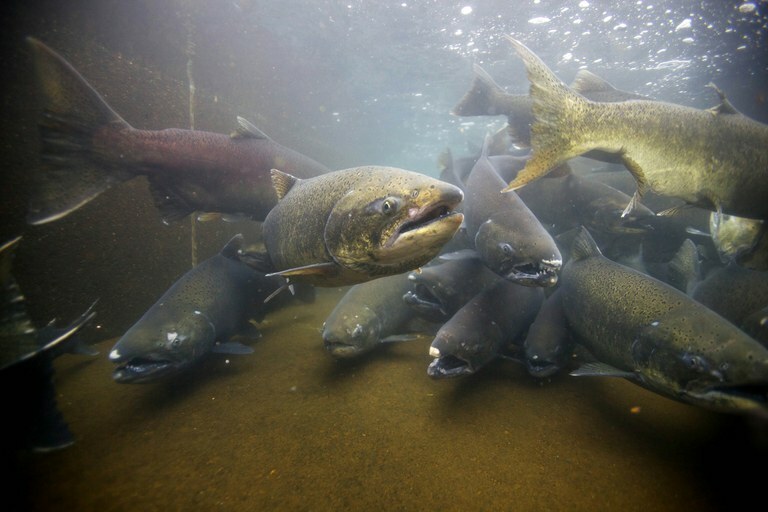 In fact, it’s been a double whammy: When the chinook returning this year were juveniles, many of their home rivers were suffering from California’s multi-year drought and the snow droughts that hit most of the West in 2014 and 2015. Both made rivers hotter and drier. Then, when the fish swam out to sea, they encountered an enormous mass of warm water in the northeastern Pacific Ocean. This unprecedented phenomenon, which scientists dubbed “the Blob,” developed in late 2013 in the Gulf of Alaska. The next spring, it spread across the entire North Pacific. “It was warm and basically sterile water,” says Laurie Weitkamp, a fisheries biologist who studies salmon for the National Oceanic and Atmospheric Administration. Normally, winter storms mix up the water in the North Pacific, bringing cold, nutrient-rich water towards the surface. But in 2014, that didn’t happen. The lowest levels of nutrients ever seen in the surface waters of the North Pacific starved the phytoplankton, microscopic algae at the base of the food web, which in turn starved zooplankton, tiny aquatic animals that prey on phytoplankton. And that starved the small fish like herring that eat zooplankton. Tracking the cause of downturns in salmon populations is complex, and some researchers are not ready to blame the Blob for the dire straits of Southeast Alaska’s chinook. “We don’t know yet what the real effect of the Blob was on chinook salmon,” Daniel Schindler, a fisheries professor at University of Washington, says. “The warm conditions in the last few years are unprecedented. But it’s too early to tell if the poor returns this year are due to climate or not.” The notion that Alaska chinook would suffer from warmer oceans defies a historic rule of thumb that salmon from Alaska do better when oceans warm up, which usually increases prey. And other stocks of Alaska salmon are thriving. “Sockeye salmon in Bristol Bay were having one of the strongest returns in history,” Schindler says. Silver salmon in Southeast Alaska are abundant, too. Correction: An earlier version of this article incorrectly characterized chinook's size.